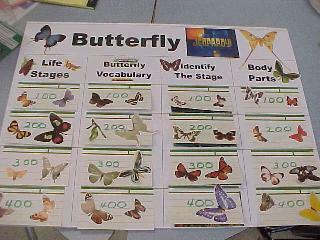 The Life Cycle of the Butterfly is a Science unit for second grades in our community, so this project fit in perfectly with our curriculum. 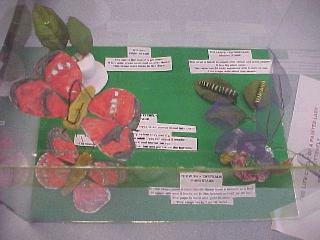 The unit includes each child having her/his own caterpillar to observe, along with a notebook in which findings are recorded. Click here for a Quick-Time movie about the unit. Waiting for Wings Special Note: This is a GREAT book for making predictions. We ALL guessed that the title meant that the butterfly was waiting for its wings, but we were wrong! What does it mean? You'll have to read the book to find out! LEARNING BY SEEING - Use clear, simple, and well designed visual references and aids such as posters, charts, and diagrams. Make use of the whiteboard, overheads, and computer generated imagery. Use graphic organizers and visual learning strategies. Highlight and organize information using color. LEARNING BY SAYING ("verbalizing") - Encourage students to verbalize by explaining, summarizing, expressing personal reactions, asking and answering questions, and participating in discussions. Have students teach or explain information to another student. Work in pairs and small groups. LEARNING BY DOING - Provide opportunities to participate in labs, do projects and field studies, role-play, and perform demonstrations and simulations. Build physical models of concepts. Capitalize on students' interests and areas of expertise. Incorporate physical activity into classwork. LEARNING BY LISTENING - This area, sometimes a weak channel for students with learning differences, can be enhanced by teaching active listening and notetaking skills. 3.Students demonstrate learning through multiple performance and product formats. As I was planning our work for the project, I actually considered this principle first. I wanted the children to have many options in presenting their knowledge of the Life Cycle of the Painted Lady to the class and me. You can view the assignment given to my students here. It should be noted that my students came up with even more ideas than those on the assignment! Their presentations served as an assessment, as well. Here is a sampling of the amazing work they produced. Andrea's beautiful 3-D models using Model Magic. Each stage has typed explanations. 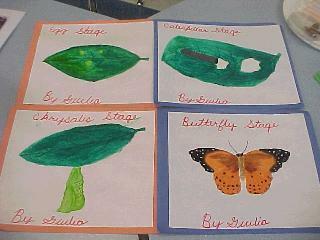 Giulia's lovely paintings with descriptions about each stage on the back. Ashley's fantastic computer generated images which she used for her "Play Teacher" (Teach the Class) lesson presentation. Sam's phenomenal "Butterfly Jeopardy" Game was not only a favorite with the class, but served as a wonderful review of many concepts, as well as incorporating math! Stefan's board game "Metamorphosis" simply blew us away! 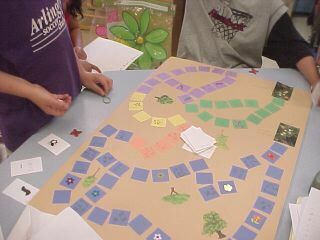 Players used little larvae caterpillars and matching butterflies as they "morphed" their way through the board. We thought this game was so great that Stefan should consider marketing it! Erin's spectacular "Flutter's Journal" shared the story of a painted lady's life cycle from an up close and personal point of view. See the text of this treasure below. My Painted Lady mother just laid me on the leaf of a mallow plant. I'm waiting to hatch. It will probably take 3-5 days until I hatch from my egg. Inside, I dream about flying from flower to flower sipping sweet nectar. Also, I'm wondering what my mother looks like. Soon I'll be ready! Hi! I'm Flutter the caterpillar. Right now I am munching on leaves. I do this all the time because I'm a growing larva. Soon I will be molting. I'll molt 2 or 3 more times before I become a chrysalis. Now I am going to climb higher in this plant and hang in a J-shape. Now I am in the pupa stage and I have formed a chrysalis. I'm hanging from a stem and I am brown with a streak of gold. Inside my wings are forming and I'm becoming a butterfly. Making big changes like this is called a metamorphosis. When my chrysalis is very dark, you'll know I'm about to emerge. Wow! I think I'm ready! Finally I'm a beautiful adult butterfly. My wings are folded up and damp so I have to shake them out and dry them. After I do that you'll be able to see my wings. They are orange on the inside and brownish on the outside. When I feel hungry I'll fly to a flower and sip nectar with my proboscis. Soon, I'll find a mate and lay eggs of my own. Watch for me in your garden! This online version of Erin's journal does not do it justice. The actual journal is hand-written in Erin's precious perfect printing. Each page also includes photos of the stage with Flutter's comments beside each; for example, on the chrysalis (pupa) page there is a photo of a painted lady in a J shape and Flutter is saying "It takes perseverance to make a chrysalis." 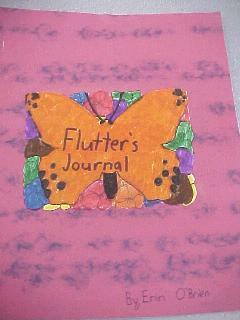 Butterflies at Enchanted Learning - an AMAZING resource - be sure to check out entire page! Recognize that plants and animals go through predictable life cycles that include birth, growth, development, reproduction, and death. Recognize that animals (including humans) and plants are living things that grow, reproduce, and need food, air, and water. 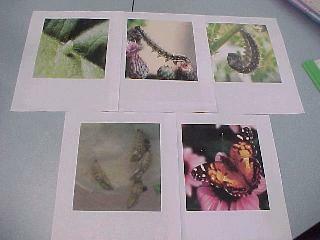 Describe ways in which many plants and animals closely resemble their parents in observed appearance. Recognize that people and other animals interact with the environment through their senses of sight, hearing, touch, smell, and taste.